Wetherby has been instrumental in a multi-million-pound redevelopment project in the seaside town of Tenby, which has seen its once famous Georgian seafront façade restored to its former glory. 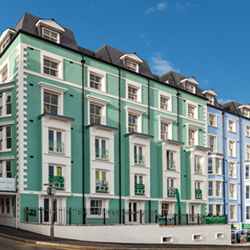 Responsible for the build project, South Terraced Properties Limited devised a plan for the development which was sympathetic to Tenby’s character and designed in keeping with the grand nineteenth century architecture which this part of Tenby is renowned for. The major regeneration of the popular South West Wales holiday destination centred around the construction of a new luxury housing development, which comprises 38 premium apartments. The new apartment block has converted a redundant site, once home to a five storey Grade II-listed building. The Royal Gatehouse Hotel was a prominent landmark in Tenby until damage caused by a blaze led to its demolition in 2008 but the new development means the site of this historic hotel has become a focal point of the town once again. The 40 week design and build project was awarded to West Bromwich-based Anglo Holt Construction, which undertook the construction of the apartment block shell, along with a basement car park. Wetherby, alongside Systex UK Ltd, was tasked with delivering the external decoration for the apartment development. Aiming to incorporate sustainable elements where possible, the construction consisted of a concrete portal frame with a Metframe pre-panelised system, which generated zero waste and a low carbon footprint. Looking to increase energy efficiency of the building once it is operational, external wall insulation was planned for the building and Wetherby designed the ideal solution. The Wetherby Epsitec system was specified, comprising 175mm EPS insulation, and designed to incorporate a drainage cavity of 25mm. The green and blue colour scheme was achieved by finishing the insulation with Wetherby 1.5mm Silicone ‘K’ in an array of complementary colours including green, light blue and dark blue. Creating a bright, attractive street scene along the seafront, the overall regeneration project is set to transform the town centre when it is completed in May 2014. The complex and precise build requirements of this development have seen the project gain approval from the National House-Building Council (NHBC).